On Tuesday night I had the privilege to attend a banquet for Pastors, Deacons and their spouses. As the "entertainment" the Ugandan Thunder choir sang. I put entertainment in quotes, because to call what they did entertaining would be shortchanging the experience. Because it was much more than mere entertaining through singing and dancing, these kids were worshiping Jesus and I felt honored that I was allowed to witness it. Photo courtesy of Pennies for Posho website. 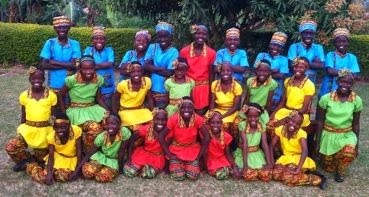 The Ugandan Thunder is a choir from, you guessed it, Uganda, Africa. The choir is made up of orphans aged 8-13 from the Royal School Orphanage and Morning Star School. You can read more about them and see some videos at the Pennies for Posho site. These children are orphans from Africa who travel across the Eastern US raising money so the children at the orphanages can eat. They sell beautiful handmade goods to raise their money. Also, you can make donations by visiting their website or you can sponsor a child for only $9 a month- That's like one meal eating out, surely we can sacrifice one time going out to eat a month so a child can eat 3 meals a day for the whole month! Because many of the orphans in Africa are malnourished. They have had hard lives. They have experienced things I can't even begin to fathom but still they have hope and joy. One little boy shared his testimony, saying that life had been hard, but because he knows Jesus, how could he not have joy and hope. Because he knows Jesus, how could he not sing. And sing they did! Oh the harmonies were wonderfully blended and the dancing was perfectly choreographed. They sang familiar hymns with such passion that it brought tears to my eyes. And it was explained to us before they started that they worship with their whole bodies... and let me tell you, they were never still! They worshiped the entire time, passionate, joyful uninhibited worship. I was so convicted. See, I was raised in a Southern Baptist church and I thought worship was just a noun, the time after Sunday School in big church with preaching and songs and prayer. And that time is often called our worship service, but worship itself is so much more. As I've matured in my faith, worship has become a verb. And no, it's not because I'm raising hands, though I may, or dancing, or jumping, but it's because worship has become something I do with my heart, not just a service I attend. But even though I actively worship Jesus, there are times that my focus is skewed and my worship is nonexistent. And this is why I was so convicted after watching those beautiful children who by society's standards shouldn't have much to be happy about let alone joyful. But they are because they know Jesus. When was the last time in my life that I had uninhibited worship, free from worry but with total focus on Christ? Their faces shown with such love. They sang of the blood of Jesus that saved them and of God's amazing Grace and they glowed with gratitude. They sang "It Is Well With My Soul" and you could tell that they believed every word. It wasn't just because they danced the whole time with such free abandon, though that was amazing to behold, but because their hearts were overflowing with every word they sang. See worship isn't something we attend or something we save up for Sundays, worship should be constant. A constant outpouring of love, gratitude, and praise to God- every day! Even if we don't get the "blessings" we think we deserve or we're going through hard times, we should be worshiping God. Even if there were no other things He had done for us, though there are many, we should be worshiping God just because HE IS GOD. But add on to that, that He saved us from eternal death and separation from him through Jesus- that right there ought to have us worshiping this very minute and every minute from here out! So from here on, I pray that my heart is overflowing with worship like the disciples in Luke 19:37-40. The Bible says that the disciples began to praise God and the Pharisees wanted Jesus to rebuke them but Jesus said, “I tell you, if these were silent, the very stones would cry out.” And I for one, don't want God to only receive worship from the stones of the earth. I want to worship God every day AND at church with my fellow brothers and sisters. Will you worship with me?